Home to the largest science center in the South Eastern United States, Tampa’s Museum of Science and Industry (MOSI) combines fun and learning for people of all ages. Visiting MOSI is an experience unlike any other and far from your typical “hands off” approach associated with many museums. Explore the numerous exhibits and displays that make up 40,000 square feet of the Children’s Science Center. 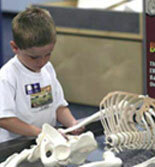 As the largest Children’s Science Center in the United States, there is never a void of activity. Covering a wide spectrum of science and health related matters, children are encouraged to design, create, build, construct, observe and play. Complete with an IMAX Dome Theatre, MOSI offers a viewing room with the only dome-shaped screen available in Florida. Five-stories tall with spectacular audio and visual capabilities, viewers will discover a viewing experience unlike any other. Outdoor enthusiasts who want to step outside will enjoy the BioWorks Butterly Garden and the forty-seven acres of various plants and wildlife in the Back Woods. Visitors seeking a truly unique and thrilling experience can take a ride on the High Wire Bike. Hoisted 30 feet above ground, adventurers can pedal a bike on a 1-inch cable. Guests can also experience the impact of 74-mph-winds of the Gulf Coast Hurricane in a simulator located near the entrance. MOSI is a must-see and do tourist attraction for any Tampa visitor. Find tickets for this attraction and other Tampa tours.